When I woke up at 4am and hit up the SPC site and saw that there was a high risk for IN/OH with a hatched 15% tornado probability, that made my decision a little easier. I hopped in the car and headed south, my original target was east of Indianapolis. I was hoping cells would pop in front of the line, otherwise it was just going to be a squall event, which makes catching tornadoes virtually impossible. I hit the east side of Indy around 9am EDT as the line of storms was closing in from the west in rather quick fashion. Turned out storms were not firing in front of the line in this area, so it was going to be a play the squall line day. I drove east on I-70 and found an exit where I could park and position myself to let the line pass me by. Hopefully it would be heading east slower than 70mph so I could hop back on I-70 and do it again! There were some nice lowerings as the line approached, but I was overall disappointed with the appearance of the line. I was expecting at least some kind of shelf cloud, but it wasn’t. For an example of something like I was expecting, check out my chase log from June 18, 2010 in Iowa. Just before the line hit me, I jumped back on I-70 to get ahead of it again and let it strengthen, maybe. Got off about 15 more miles down and actually let the line overtake me at that point. Definite wind gusts over 60mph, easily. Hopped back on I-70 and tried again. This time when I got off, I was unable to stay in front and at that point it became obvious there was no catching up again, so the chase was over. Overall, the squall line was about run of the mill. 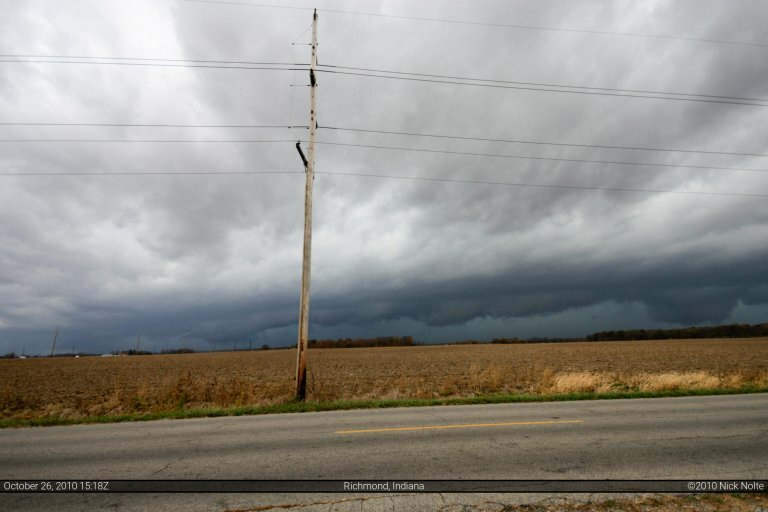 There were some tornado reports in the region, but most of them were on the ground for a few seconds to a minute or two, something you’d only see if you were serendipitous enough to be in exactly the right place at exactly the right time. 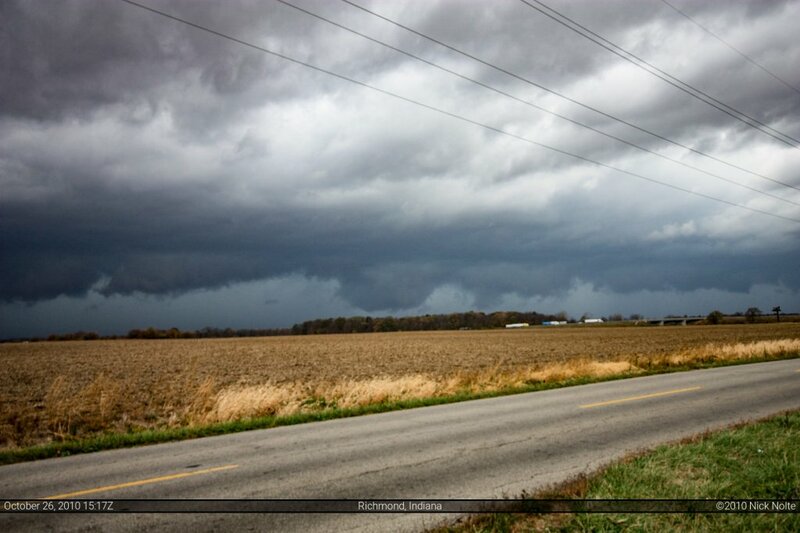 It was a fun chase, for sure, and seeing as it is potentially the last one until next spring, it was worth the drive.